Calf boots are stylish but they can be one of the most difficult types of women’s boots to get right. 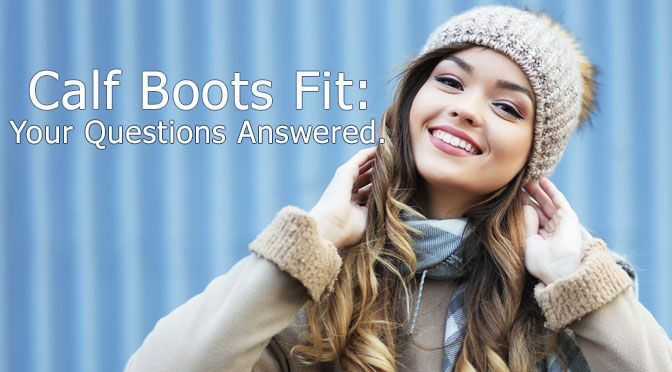 The fit is important, so shopping for calf boots can be a challenge for many of us. We want to help you embrace this versatile boot style and find a pair that suits you down to the ground. Any boot that rises above your ankle but finishes below your knee is a calf boot. This means that calf boots come in a wide variety of styles. Some are quite tall whilst others are relatively short. The most common type of calf boot is the mid-calf boot, finishing just as it sounds, around the middle of your calf. The nature of calf boots make them one of the most difficult boot styles to fit. Not only do you need to consider the fitting around the foot just like any other shoe, you also need to get the right size around the calf for a comfortable fit. Getting the right calf boots to suit your feet is just like choosing the right size shoes. Check our women’s shoe size guide and women’s shoe fitting guide for more advice. However, most ladies are more concerned with getting the right fit around their calves. We’re here to help with your common fitting queries. To look their best, calf boots should fit snugly around your calf. Too much of a gap spoils the look of the boot so if a calf boot is gaping it’s probably not the one for you. However, if the boot fits too snugly it will cause the leg to bulge and may cause discomfort. If the top of the boot fits you like a glove you’ve found your perfect match. The fit is simple in theory but much more difficult in practice. In reality, women’s calves are all sorts of sizes for all different reasons. Height: a calf boot might meet a different part on the calf of a petite lady compared to a tall lady. Biology: we come in different shapes and sizes, that’s what makes us unique! Some of us naturally have wider or narrower calves than others. Exercise: some of the fittest women you’ll meet have very pronounced calf muscles due to regular exercise. Running and cycling help to build the muscle up. Others may not build up the calf muscles as much, such as swimmers. All of the above goes to demonstrate that there’s no ‘one size fits all’ approach to calf boots. Getting the right fit is about knowing what to look for in a boot and avoiding the styles that don’t work for you. Wider calves can present a challenge if you’re looking for calf boots. Some ladies might even feel they should avoid the style but that’s not the case! There are plenty of things you can look out for to get well-fitting, wider calf boots. Extended calf boots: sometimes you’ll find styles called ‘extended’ calf boots. This means they’ve been made a little bit wider for a more comfortable fit. Look out for this if you’re struggling to find a boot that fits. Elastic panels: some boots come with side panels made of elastic that will add a little bit of give to the boot. These can be really effective for creating that ‘just right’ fit. Full zips: a zip that fully opens down the length of the boot will help make getting them on and off more comfortable. Making them wider: if you fall in love with a pair of calf boots you might be wondering how to stretch them. Most boot materials will have a little give but really it’s best not to stretch them out of shape. There are a couple of options to make them a little more comfortable, though. One nice little fix for making calf boots wider is a boot band. These useful adaptors are currently only available in the US but if you’re handy with a needle and thread it might be possible to make yourself something similar! The concept is simple, it’s a little piece of v-shaped fabric that zips into your boot to help widen it. What’s even better is that this doesn’t damage the boot at all, so it won’t be stretched out of shape. If boots are just a little too snug and made of leather you can stretch the calf to make it more comfortable using heat. Wear your thickest pair of socks (that reach the area you want to stretch) and heat the tight areas using a hairdryer whilst wearing them. Keep them on whilst they cool and this should help them mould to the contours of your leg for extra comfort. Narrow calves can present just as much of a problem as wide calves. Women who are slim in this area can often find that everything they try leaves a gap which can leave them feeling like their body looks out of proportion. Here are some things to look out for to help you find the right fit. Style: slouchy calf boots can work well for narrow calves. They have a softer appearance so the gap is to be expected. Avoid smart, fitted styles that don’t fit snugly as these will look out of place. Adjustment: some styles like lace up or buckled calf boots can be adjusted for a tighter fit. Try these if you have narrow calves. Stretch: calf boots with some stretch will usually be on the narrower side so they can expand to fit different sizes. You might just find they’re a great fit! Aim for mid-calf: choosing a calf boot that stops at the widest part of your leg can help make calves appear wider. Heel height: high heels elongate and slim the appearance of the leg. If this isn’t the effect you’re after, stick to a flat or low to mid height heel. Don’t colour match: wearing the same colour tights, jeans or leggings as your boots also gives a slimming appearance. If you want to create a bulkier illusion opt for boots of a different colour. Now, go forth and find your perfect pair of calf boots. We’re sure there’s a pair out there for you! I was under the impression if the shoes you ordered on line were not suitable you could return them to your nearest store and get a refund so you could choose something else I did not realise you do not get refunded for two weeks or more. Our Customer Services team would like to look into your query for you, could you please email your contact details to customerservices@shoezone.com and someone will be in touch with you shortly.